The 830 Series Is A New Narrow Design To Accommodate A Large 300 Cu. Ft. Oxygen Cylinder Up To 10 1/2'' In Diameter In The Back And A Large Acetylene Cylinder Up To 12 1/2'' In Diameter In The Front. *Base Plate Dimensions Are 8'' X 12'' In The Front And 11'' X 11'' In The Rear. 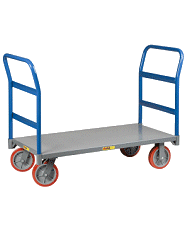 *This Narrow Design Allows For Better Maneuverability In Narrow Aisles Where A Normal Side-By-Side Cylinder Truck Cannot Go. *This Model Features A Large Continuous Handle Which Provides For Greater Stability And Safety. *Welding Rods Can Be Secured Inside The Cylinder Brackets. 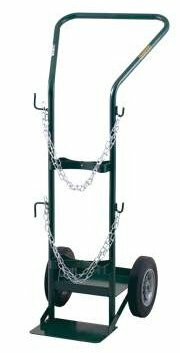 *Comes Standard With Two Cylinder Hold Chains And Hose Reeling Hooks. *So-2 Bolt On Tool Box Is Available As An Option.